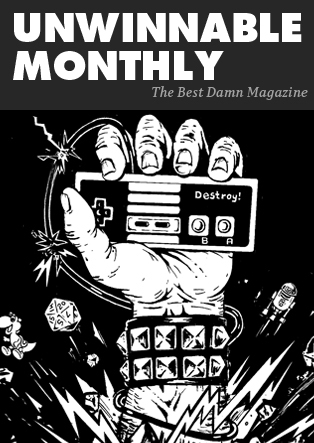 This is a reprint of the letter from the editor in Unwinnable Monthly Issue 97. You can buy Issue 97 now, or purchase a monthly subscription to make sure you never miss an issue! First off, we had a bit of a kerfuffle over the weekend involving an internet hate mob and, with Thanksgiving around the corner, it has put me in a mindset of gratitude. I would like to thank you — writers, subscribers, readers and editors — for continuing to make Unwinnable a vibrant place to read, write and exchange ideas. We’re coming up on Issue 100 next year, as well as our eighth birthday, and I can tell you, it has never been anything but a joy to serve you as editor in chief. 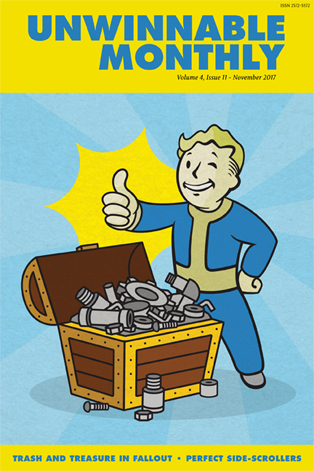 Our cover story this month, by Agustin Lopez, investigates how the trash of one world becomes treasure after the nuclear apocalypse of the Fallout universe and what it says about the world we live in. Alex Flannery’s clean, graphic style was a perfect choice for this — more on him in the Artist Spotlight. Our second feature, by Aron Garst, takes on the question of how to make a great sidescroller. He turns to the developers of Shovel Knight and Runbow for insight. Michael Calia delivers a short story about the distressing behavior of a totally fictional president and we round out the long form stories with a sponsored Q&A with the developers of Rite of Ilk, an intriguing co-op game. Our columnists are as eclectic as ever. Gavin Craig ponders the hollowness of Mario. Meg Condis discovers a key problem in the growing world of professional esports. Casey Lynch cherry-picks the best metal of the month (my faves: Quicksand and the surprising Spook the Horses). Brock Wilbur’s latest turns his horror-hunting sights on the classic 1992 Alone in the Dark. Deirdre Coyle talks about her first marriage to goth-warrior Farkas of Skyrim fame. Matt Marrone gives us a final word on Twin Peaks. Meanwhile, I get all my bile for the soundtrack to Stranger Things 2 out and Sara Clemens finds an appealing sort of nostalgia in Thor Ragnarok. Rob Rich uses the Persona series as an example of how videogame sequels should be done and, finally, Jason McMaster digs deep into his past to explain the surprising emotional toll of Wolfenstein II: The New Colossus. Corey and Amanda will be back next month along with our crossword and our newest columnist, Yussef Cole. You should read Yussef’s most recent essay for us on the site: “Cuphead and the Racist Spectre of Fleisher Animation.” It’s an amazing and informative read. Lastly, if you’re in the North Jersey area this weekend, come hang out with us at Geek Flea. If not, see you here in December!